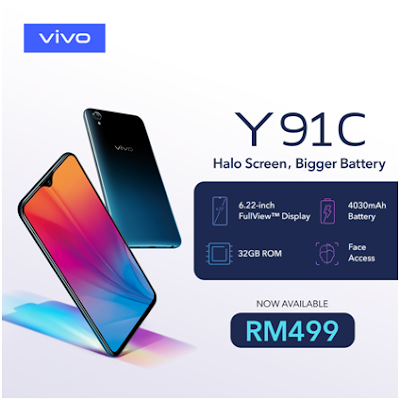 Kuala Lumpur, 12 March 2019 – Vivo announces that the Vivo Y91C is officially available for purchase in Malaysia after the recent success of their V15 series. The Y91C is fitted with a 4030mAh large-capacity battery, which works with its exclusive smart power management system, allowing for a longer-lasting endurance. Users will never worry about running out of power, which is great for those who love playing games, streaming videos or listening to music for long periods of time. Its 32GB of ROM gives the user ample freedom to store more photos and files without the need to frequently declutter and also offers the user the option to expand up to 256GB to save accordingly to your needs. Vivo also offers the user Face Access technology with the Y91C to unlock the phone instantly the moment the user picks it up. Accessing ones phone has never been more convenient. By redesigning the screen and the notch, the Y91C gives the user a further enhanced viewing experience with a screen-to-body ratio of 88.6% with its trendy 6.22-inch Halo FullView™ Display. In addition to their smart design, smart hand gesture controls makes using its large display effortless. The phone uses AI photo algorithms for its camera to automatically deliver facial enhancements, saving you having to manually adjusting beautification levels, making every shot a professional shot. Running on Funtouch OS 4.5 based on Android which results in faster processing speeds while consuming less power, it allows users to open apps faster, switch between them seamlessly, and enjoy a smoother user experience. The phone also boasts of a 13-megapixel + 2-megapixel dual rear cameras and an 8-megapixel camera which is great given its affordable price point. Adopting a stylish back-cover gloss painting process, it intricately blends black and deep turquoise to invoke a breathtaking visual effect. The 3D curves fit your palm perfectly, for an experience that is truly irresistible. The Vivo Y91C is now available in Malaysia for the recommended retail price of RM499.